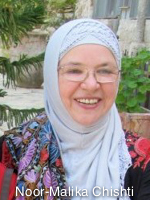 Noor-Makika Chisti has been involved with interfaith for over 40 years. Her early training in a Sufi tradition that honors the diverse ways in which people approach spiritual practice laid the ground for her work. Almost 20 years ago she converted to Islam when she began exploring the Islamic roots of Sufism. Today, she serves as Vice President of ReGeneration, an interfaith non-profit seeding the Middle East with an educational philosophy that embraces life, learning, the arts, the earth and all the children. Noor-Malika is a Founding member and Event Co-Chair of the Southern California Muslim-Jewish Forum, an umbrella body focused on strengthening Muslim-Jewish ties in Greater Los Angeles. She is a Founding member and Vice Chair Emeritus of the Southern California Committee for the Parliament of World Religions. At the 2009 Parliament of World Religions held in Melbourne, Australia, she presented in three workshops: “Listening with a Heart of Mercy,” “Listening to the Other: Building a House of Prayer for Christians, Jews, and Muslims,” and “Spiritual Intimacy: Taking Interfaith Engagement to the Next Level.” Noor-Malika also was on a panel and workshop at the Globalization for the Common Good conference held in 2010 at California Lutheran University, also on the theme of spiritual intimacy in interfaith engagement.